The Slash Creek Condominiums, a stunning waterfront community, are located on Highway 12 in Hatteras Village. It is surrounded by canals for great water views and easy access to world-class off-shore fishing. Slash Creek units offer 2 bedrooms and 2.5 bathrooms. Each unit owner in Slash Creek enjoys access to the private pool and has an assigned boat slip and parking space. The boat slips are only available for boats 25′ or less. No boats equipped with a head (toilet) will be permitted. 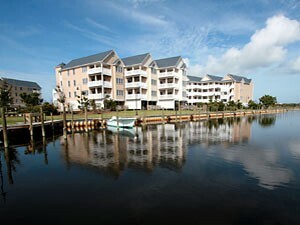 Slash Creek Condos are located in the heart of Hatteras Village. This quaint town offers everything owners and guests need for a great vacation, including a number of shops, restaurants, the Graveyard of the Atlantic Museum, the Hatteras Island Library, and ferry access for those who may want to enjoy Ocracoke Island. Slash Creek gives owners and guests alike a unique experience in Hatteras Island.